Inbound traffic on the Massachusetts Turnpike. For generations, standstill traffic has been as central to Boston’s identity as clam chowder and the Red Sox. So why hasn’t it combined with another favored pastime — politics — to become a dominant issue in election campaigns? Despite vexing hundreds of thousands of commuters every day, traffic congestion has rarely been featured in statewide elections. Even when transportation was near the top of the public agenda in the era of highway expansion and during the Big Dig, it was rarely the central issue driving voters to the ballot box. Now, with legendary backups only getting worse, the two Democrats vying to unseat Governor Charlie Baker are trying to break that mold. Jay Gonzalez, the budget chief under former governor Deval Patrick, and environmental activist Bob Massie are each trying to make the many transportation woes in Massachusetts a central theme of their campaigns, arguing Baker has done little to fix something that affects so many people. They’re both calling for increased spending on the transportation system. 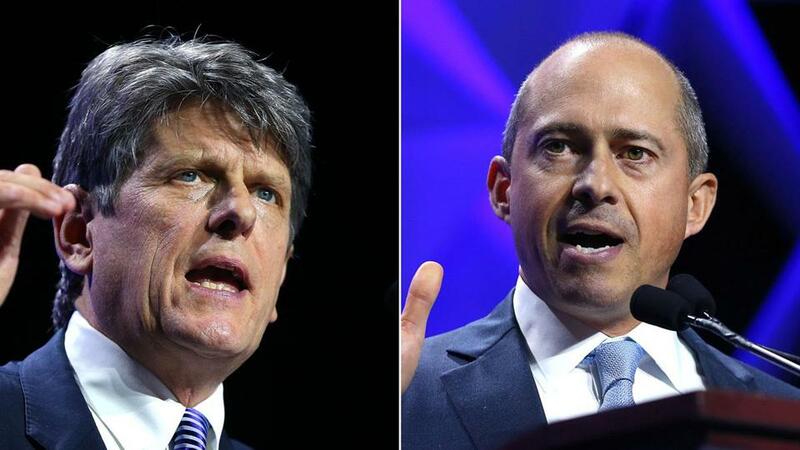 The two Democratic candidates for governor, Bob Massie (left) and Jay Gonzalez (right), are keying in on transportation in their bids to unseat Charlie Baker. It may be just populist appeal from candidates who have struggled for name recognition against a highly popular governor. While no one likes sitting in traffic, congestion is often a side effect of a humming economy. And humming economies often win elections. It wasn’t that long ago that transportation, particularly highway construction, helped define modern Massachusetts politics. Traffic congestion, according to news accounts at the time, was thought to have contributed to the electoral losses of incumbents such as governors Endicott Peabody in 1964 and Paul Dever in 1952. 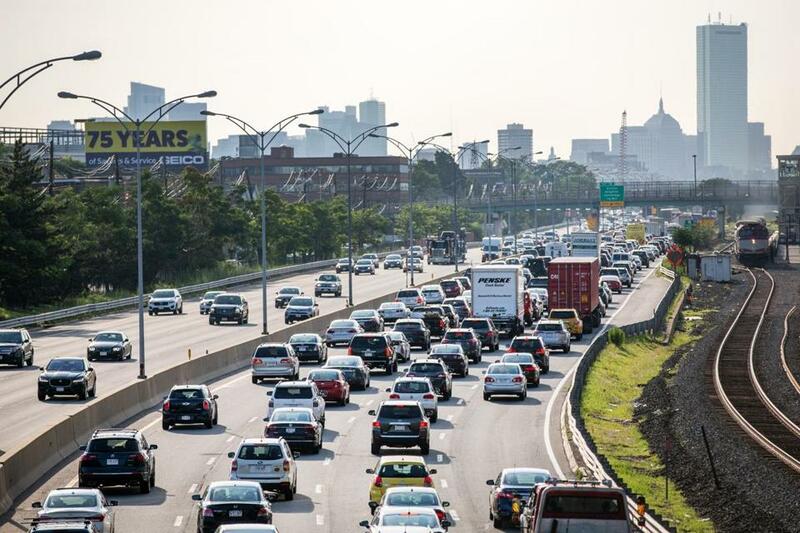 The nascent environmental movement scored its first major victory in Massachusetts with the defeat of the Inner Belt, a massive radial highway that would have ripped up neighborhoods around Boston. In the early 1970s, activists persuaded Governor Frank Sargent to halt construction and promise no new highways near Boston. Transportation was also a prominent divide between Michael Dukakis and Edward King during their storied political battles for governor in the 1970s and ’80s. King favored highways and pushed hard to expand Logan International Airport over neighborhood objections. Dukakis, a Brookline resident who took the Green Line to the State House, favored public transit. But he also borrowed an idea from King — expanding the Massachusetts Turnpike to Logan — that he combined with one of his own — burying the Central Artery in Boston — to eventually produce the Big Dig. Yet despite the candidates’ fiercely different approaches to transportation, the Dukakis-King showdowns were dominated by social issues and corruption allegations, said Dukakis’s transportation secretary, Fred Salvucci. Baker, meanwhile, has mostly had his hands full with the MBTA. Just days into his term, the public transit system suffered extended breakdowns from the epic winter of 2015. Since then, his administration has tried to impose a series of changes on the Massachusetts Bay Transportation Authority to control spending on daily operations, while also increasing by billions of dollars the investment in long-neglected repairs and improvements. But it will take years for those efforts to bear fruit, and just this week the risk to Baker was highlighted by another agonizing series of breakdowns and delays on the Red and Blue lines, and commuter rail. The governor argues that fixing the T also helps fix the roads. More reliable service, the thinking goes, may draw some drivers onto rails and buses. While Baker has backed the expansion of the Green Line and the commuter rail to the South Coast, Gonzalez and Massie have called for greater expansion of the system. Unlike Baker, both Democrats have called to raise new transportation revenue, but neither has fully said how. Massie has suggested new fees on heavy commercial trucks, while Gonzalez has said he wouldn’t have a detailed plan until he reaches office. On road congestion matters, Baker has tiptoed around a volatile issue: tolls. Twice this summer, he rejected a legislative proposal to test a toll discount program for commuters who drove outside rush hour. The idea was a twist on so-called congestion pricing, which typically charges higher tolls during peak times or in busy areas. It’s been shown to cut down on traffic in other parts of the world, but comes with the obvious political headaches associated with raising tolls. In a letter to lawmakers Baker suggested he was uninterested in congestion pricing as a solution, and that he didn’t think a small discount would have much impact on traffic. Gonzalez said he would have allowed the toll discount program and believes the state should consider congestion pricing. Massie says he’s open to the idea but has similar concerns to Baker: that congestion pricing would punish low-income workers who have less flexibility in their work schedules. The nine-month study won’t be complete until well after the November election. And Baker may have good reason to be cautious about toying with the cost of driving. In 2014, Baker shared the November ballot with a measure to repeal automatic increases in the gas tax. Both Baker and the repeal won; the tax question received some 50,000 votes more than he did.